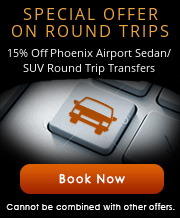 Roadrunner Limousine offers affordable and competitive pricing for executive transportation services in Phoenix. We offer flat rates for airport transfers to Mesa-Gateway Airport, as well as and hourly rates for local transportation. We can accommodate individuals or groups of up to seven people in our comfortable, clean, well-maintained vehicles. Our friendly, knowledgeable customer service staff and professional, experienced chauffeurs deliver a hassle-free experience. Book online, by phone, or with our simple, easy-to-use mobile app - for Andriod or for Apple. After you book, Roadrunner will email a reservation confirmation and receipt. Questions? Call 480-310-7773 and speak with one of our friendly, knowledgeable customer service staff.